A§E contains 2 localization tests: (1) ILD localization and (2) azimuth localization. The azimuth localization is a typical localization test with 5 or 7 loudspeakers. This test requires the SoundC hardware (contact Otoconsult for more information). The ILD localization test only requires 2 loudspeakers. 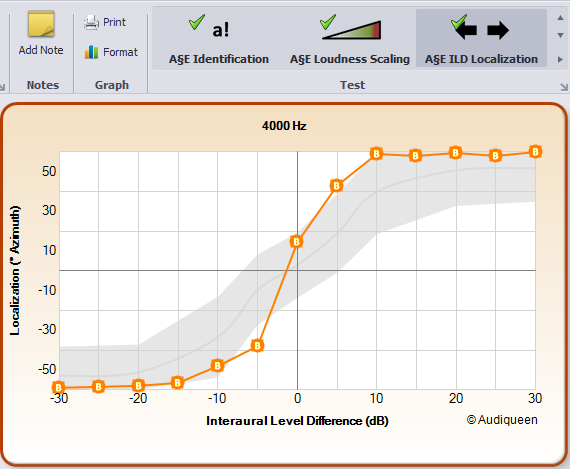 It assesses the localization acuity based on high frequency interaural level differences and is mainly useful to evaluate cochlear implant recipients. A§E ILD localisation results. The normal zone is highlighted in grey.